The Great War ended with the Armistice of 11th November 1918 with people in a vengeful mood: the enemy must be made to pay. The soldiers were demobilised and somehow, in the year between the end of the war and Armistice Day 1919, the mood changed. Military pride changed into a deep-felt desire to salute the dead by raising memorials to them. Soon every town and village had one. They were in fact, an emotional closing of the book on The Great War. 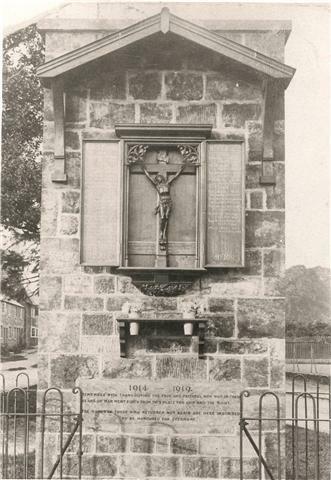 Dedicated one Sunday afternoon in 1919, the war shrine was unveiled by Mrs Barnett of The Holt, who with her husband gave the shrine to the village in memory of the 22 men who had lost their lives during the First World War. It is also dedicated to their son Ronald, who died of meningitis in 1918 at the age of 16. During the war 1914-18 war 185 men from the village served in the armed forces. Joe Watkins, a village carpenter who lived in Royal Oak Lane, made the wooden canopy. The masonry is Horton stone and was built by Mr Tom Bonham and his son Reg, The original shrine was enclosed in an oak cabinet, the names of the fallen were inscribed in gold on the inside of the two doors. The cabinet has since been replaced and the names of those who died in the Second World War have been added to this memorial. This is one of three war memorials in the village. 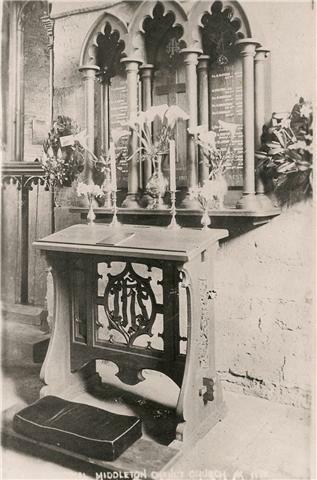 A second memorial is located inside the church and was given in 1920 by Mrs Severne of Thenford House. The third memorial is the large cross in the churchyard, which was subscribed by the parishioners and unveiled by the Reverend H.P. Brown on the 10th July 1921. Local legend has it that this site was originally the burial ground for 46 parliamentary soldiers who were buried here in 1643 following an English Civil War skirmish on the outskirts of the village. 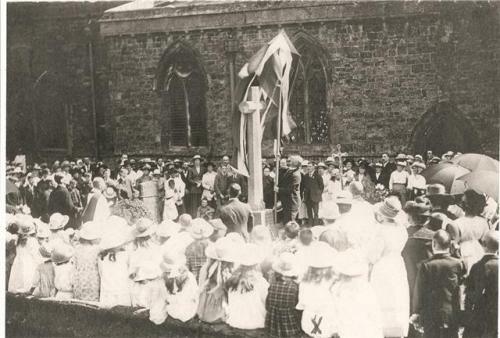 Older village residents used to recall that before the First World War this area was a rose bed, laid out in the form of a cross.